Nikon S3 Year 2000 Millennium (Y2K) model is a near duplicate of the rangefinder camera Nikon S3 released in March 1958. It was produced in limited quantity to commemorate the year 2000 millennium. The S3 Y2K was made identical as possible to the original Nikon S3 except for very minor details to accommodate present camera operating practices, including the change in the exposure indication from "20" to "24," and the film sensitivity indication calibrated in "ISO" instead of "ASA." Nikon started their 35 mm rangefinder camera product line with Nikon I launched in 1948, which evolved into M and S later, and the rangefinder series was valued highly as a line of main cameras until the single-lens reflex (SLR) cameras became widespread. The S series was the precursor of Nikon F and was highly regarded as a classic camera, and there was a growing call for its revival from many enthusiasts. Nikon S3 was a relatively later model in the S series, featuring a rangefinder with the world's first life-size 1:1 viewfinder for 35mm focal length lens. The Nikon S3 Y2K precisely reproduced not only the 35mm life-size viewfinder but also the focal length adjusting gear unit arranged in the upper right of the body, and the quiet and soft shutter releasing sound called “whispering shutter” which in those days was achieved by the cloth focal-plane shutter curtains. The S3 Replica model was produced based on orders, and the orders were accepted from April 6, 2000 to June 30, 2000. It was first shipped in October 2000 and approx. 8,000 units were sold. The standard equipment Nikkor S 50 mm f/1.4 lens was a reproduction of the lens incorporated in the Olympic version, known as the all-black chrome-finish “later series” type. It was a multi-coated lens just like the currently available Nikkor lenses to ensure a higher degree of color reproducibility. 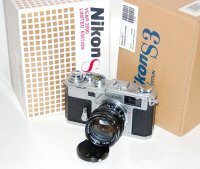 In June 2002, Nikon S3 LIMITED EDITION BLACK was introduced in a limited quantity of 2,000 by redesigning the S3 Replica model with a black chrome finish.